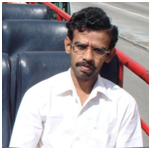 Chelvam Venkatesh was born and grew up in the suburban of Chennai, Tamilnadu. He attended R.K. M. Vivekananda College in Chennai where he received his B.Sc (1996) and M.Sc (1998) in chemistry. His doctoral work was in the synthesis of heterocycles and rearrangement studies of cyclopropanes under the direction of Prof. Hiriyakkanavar Ila at Indian Institute of Technology Kanpur, where he received his Ph.D. degree in synthetic organic chemistry in 2005. He then joined as a postdoctoral fellow in the laboratory of Prof. Hans-Ulrich Reissig at Freie University Berlin, Germany in 2006, where he was awarded Alexander von Humboldt fellowship and worked on total synthesis of natural products. In 2008, he moved to Purdue University, USA to join the research group of Prof. Philip S. Low to work on targeting ligands for therapeutic and diagnostic applications of cancer and inflammatory diseases. In 2012 he joined the faculty at Indian Institute of Technology Indore, India and his research interests include synthesis of natural products, heterocycles, carbocycles and small molecule targeting ligands or inhibitors for therapeutic and diagnostic applications of pathological diseases.